Place all ingredients except for the bacon into the food processor. Process until smooth. At first it will be watery but if you pulse and scrape the sides a few times, it will whip up to a nice sour cream-like consistency. Pour into serving dish, top with bacon and more scallions, and serve with the chips. I was so confused when I first saw chocolate tortilla chips! I have been familiar with Food Should Taste Good for about a year now and love many of their chip varieties, but I just couldn't wrap my head around the idea of chocolate tortilla chips. Would they taste super sweet like a dessert? Would they have a more crackery texture as opposed to the crisp corn chip texture we’re used to. Well, thankfully the answer is no to both those questions! These are just like any other tortilla chip, just with chocolate flavoring instead of, say...a hint of lime or something along those lines. They have just the right amount of chocolate to balance the salty corn crunch we all know and love from tortilla chips. I decided to pair these chips with a dip made from chocolate stout. This Bacon Stout Dip would be perfect at a beer tasting party, the Super Bowl, or really just any get together where people love beer! The dip is as easy as putting everything into a food processor and turning it on! At first it will seem a little watery, but keep pulsing and scraping down the sides, and it will eventually whip up and become a nice sour cream-like consistency. The dip has a nice bitter flavor from the beer, is salty from the bacon, and has a nice sweetness from the cream cheese and honey. Go sweet with it with this S'more Dip recipe. Chiles always work with chocolate, like in this Chipotle Ranch Dip recipe. 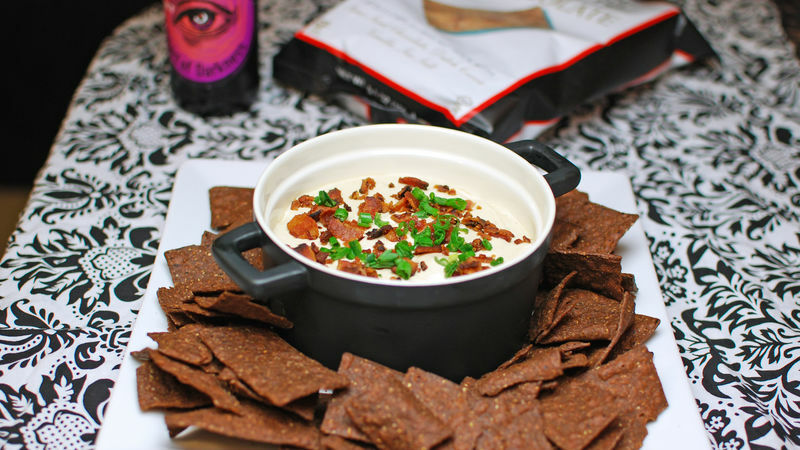 Bacon + Chocolate = Love is the equation in this Bacon-Cheddar Dip recipe. I think roasted red peppers taste great with anything, and the proof is in this Roasted Red Pepper Dip recipe. Dan Whalen wonders what type of get together has people who don’t love beer. He has been blogging for over 4 years at The Food in my Beard; check Dan's Tablespoon profile often to try his recipes with creative international spins!